IDJ: For anyone looking towards the west from around 1966 onwards, the Tsing Yi Power Station site was an increasingly prominent feature of the harbor view. As the five tall concrete chimneys were built progressively from 1968 onwards, no one could fail to see them against the backdrop of the hills on the island. An illustrated brochure was handed out to a large numbers of VIPs and invited visitors to the opening ceremony and reception at the power station’s main control room. They were transported to the site in chartered Star Ferries. The station was initially designed for six 120 mega-watt units with a provision for extensive future expan­sion. In addition, an area of 1.1-million square feet was earmarked as a tank farm to ensure continuity of fuel oil supplies. 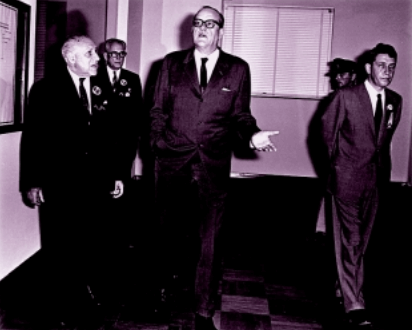 The first of the 120,000 KW turbines was com­missioned in April, 1969, the second in the autumn of 1969. Each was served by an 840,000 lb. /hr. boiler, which dis­charged its flue gas through a 425-foot chimney. The boiler units were corner fired and of a reheat type with working con­ditions of 1,800 lbs. pressure and 1,000 degree F. temperature. Considerable savings in capital were achieved by erecting at the outset the buildings to accom­modate all six units and their aux­iliary plant that comprise the first station. The main building was 576 feet in length and consisted of a turbine room, a boiler house, a pump bay, and an office block. A 132 KV switch-house to ac­commodate 22 circuit breakers was positioned south of the turbine room. Its ground floor was occupied by the generator transformers, unit and station transformers together with water cooling auxiliaries. The upper two floors contained switches and bus-bar equipment. The turbine room was equipped with an overhead electric travelling crane of 118 feet span, capable of lifting 130 tons. The pump bay housed feed pumps, unit control rooms, auxiliary boards, auxiliary transformers and station and unit boards. Two upper floors of the pump bay accommodated the Deaerators and reserve feed-water tanks. Two lifts installed in the pump bay provided quick access to the upper floors and the upper levels of boilers. The administrative office was situated east of the station and designed to serve both this power station and the future ‘B’ power station extension. 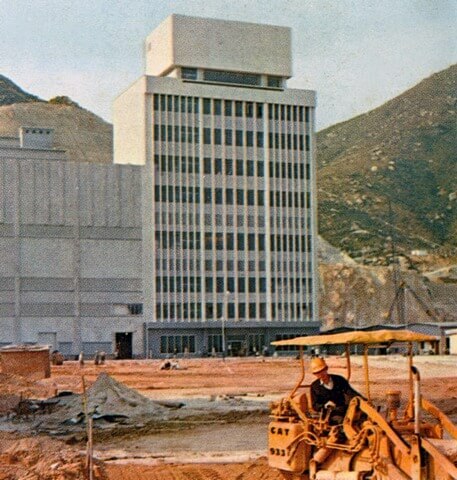 The office block contained a main control room, with a large picture window over-looking the turbine room, and a cable gallery immediately under the control room, which connected by means of reinforced concrete cable stacks with a net of underground cable tunnels and cable ducts. Besides the administrative offices, the office block contained the clinic, laboratory, instrument workshop, lecture and conference rooms, mess rooms and other facilities for station personnel and resident engineers. Owing to the presence of silt, the station was sited close to the original seashore line, clear of deposits, to avoid possible complications with the erection of foundations and difficulties which could have been encountered during construction of the underground structures. Most of the foundations and other structures were erected on top of 3,600 x 110 tons piles from 20 to 75 feet in depth, but some of the footings, including those for the rein­forced concrete chimneys, were built on solid foundations of rock. 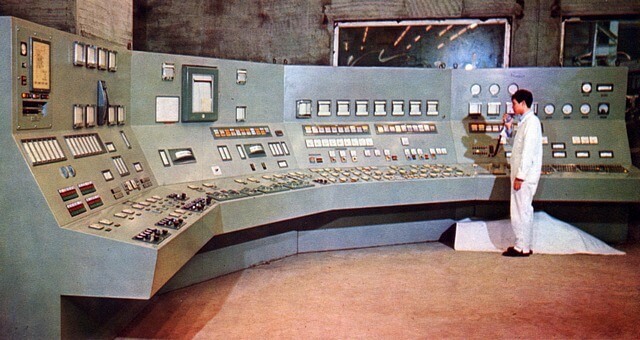 The intricate control desks were part of the instrumentation and automation of local unit control rooms designed to operate two turbine/boiler units. From these controls the generating complex could be operated to meet the demands of the electrical loads in the most efficient manner. Transmission of power to China Light for distribution to customers was managed from the main control room in the office block. The main building was constructed of steel framing with concrete casing. The boiler house for the first two units was faced in PVC coated steel cladding. The remaining four boilers were of the outdoor type capable of burning any petroleum fuel including naphtha gas that was to be sourced from Singapore. The screen-house, designed for seven 73,000 gallons-per-minute pumping and seawater screening units was situated 80 feet from the seawall. The area where the screen house stood was thoroughly dredged to remove silt and stones and refilled with selected cohesive soil. The area under the screen house was extensively piled. Other component parts of the screen-house necessary for connecting with the sea were precast on site close to the seawall. The largest of these structures weighing over 80 tons each were the rein­forced concrete intake culverts. 5,500 tons of reinforcing steel, 200,000 cu.ft. of timber, 8,000 tons of structural steel, and 2,500,000 bricks. In the course of construction of the plant, 600,000 labour man­-days were employed. Although most people assumed the power station to be a China Light & Power facility it was operated under the banner of (PEPCO), the Peninsula Electric Power Company, although permanent employees stationed there were all China Light personnel. 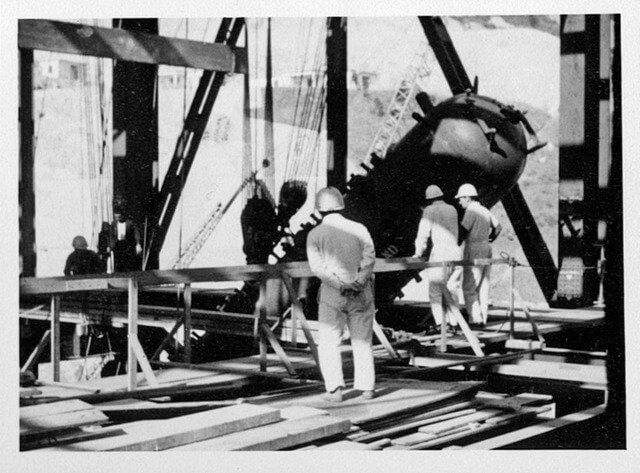 As Tsing Yi Island was only accessible by sea, all construction equipment and labour had to be transported through the harbour to the power station site. A large fleet of Walla-Wallas and motor boats commuted between a variety of piers in Kowloon and Hong Kong Island throughout the day and night. In the event of a typhoon signal No 3 or higher, sufficient employees had to remain at the power station for the durations of the typhoon’s passage to ensure power supplies were maintained to Kowloon etc. 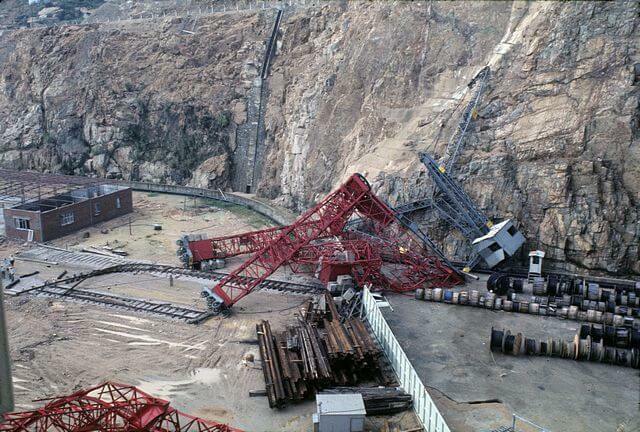 Typhoon Rose caused a great deal of damage including the blowing down of large construction cranes. It was not until February 1974 that the first Tsing Yi road bridge was opened by the Governor Sir Murray MacLehose. The large fleet of vessels transporting staff and workers seven days a week covering the three shifts that operated over 24 hours per day could then be dispensed with. The power station operated successfully throughout the 1970s and 80s in parallel with Hok Yuen Power Station at Hung Hom. During this period part of the electricity output was sent over the border to south China to assist with the acute power shortages there as industrial production was starting to boom very fast. Visitors over the border at that time may recall seeing large diesel-electric generators sat outside every factory belching out fumes in an attempt to obtain secure electrical supplies. On a visit across the China border on business, this writer remembers seeing large diesel generators sat of their skids haphazardly placed on the border town’s pavements with their power cables pushed through building’s windows to connect with their electrical systems. Also of interest were the obviously stolen right-hand drive cars with mainland registration plates casually stuck on top of the Hong Kong plates parked and in use in the Police, Immigration and Customs compounds. Cross border electricity transfers increased considerably over the years. 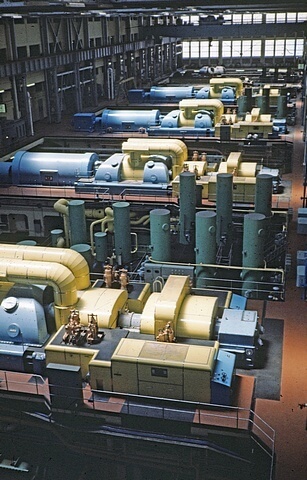 As the new and much larger output Castle Peak coal-fired power station gradually took over most of the generation of electricity to Kowloon, the New Territories and cross-border supplies, the Tsing Yi and Hok Yuen Power Stations were generating less, but were kept in excellent condition in case needed to cover possible equipment breakdowns at Castle Peak. The security of electrical power supplies being paramount in Hong Kong’s densely populated high rise environment. With the addition of the new gas-fired Black Point Power Station in the 1990s, the older power stations were decommissioned and ultimately demolished and their sites cleared. 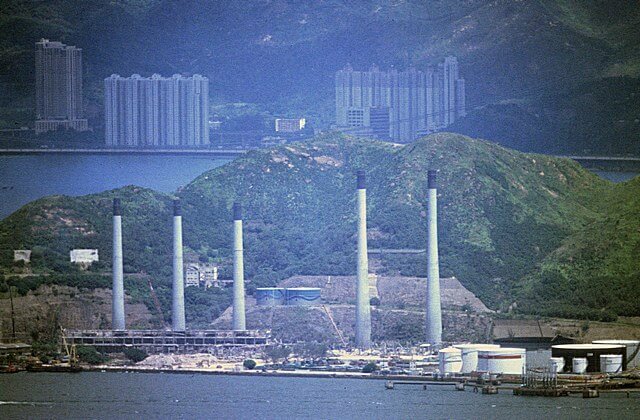 Tsing Yi Power Station’s five concrete chimneys were felled by controlled demolition all at the same time providing a spectacular sight not normally seen in Hong Kong. This article was first posted on 18th May 2014.